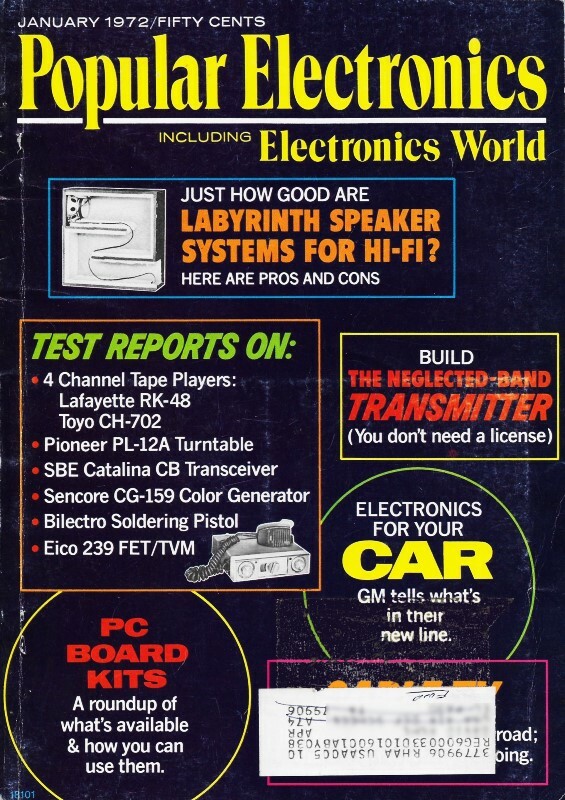 According to this 1972 article in Popular Electronics magazine, cable television began around 1950. The system was very different that what we have nearly 70 years later. The familiar acronym CATV does not stand for CAble TeleVision, but rather Community Access TeleVision. 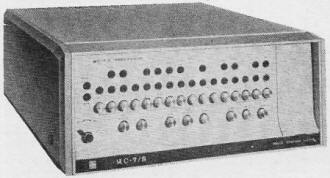 CATV, as originally implemented, was a means of bringing broadcast TV to areas either too remote or too shielded from over-the-air (OTA) RF signals to provide good signal reception. Depending on the need, CATV could range from re-broadcasting of signals into targeted areas or sending signals through cable (originally unshielded) to individual homes. As you might expect, opponents of the new system predicted that such a scheme would eventually be the kiss of death for local broadcasters since large, well-funded conglomerates would be able to dominate programming selection and dry up advertising revenue from local businesses that could support local stations. History now shows that not only did the local stations survive cable networks, but the recent "cord cutting" phenomenon is actually causing a reverting back to OTA reception by homeowners (like moi), thus helping to ensure a long life for local stations. Towers bristling with TV antennas, such as these at a Jerrold system in Harrisburg, Pa., were main source of signals for CATV. Now, operators originate signals of their own. The winding road to Cable TV may lead to more and better viewing. Cable television is an enigma. The further it goes, the harder it is to tell just where it is going. When it was simply community antenna TV (CATV), it provided the simple, basic service of bringing TV reception to those areas that broadcast stations could not reach. But 22 years have brought about changes. Purposes and outlook have changed - not to mention the name. Today's cable TV is a system for delivering many channels of TV to home receivers by wire (coaxial cable). Some channels deliver nearby station programs that you would receive anyway. Others carry signals imported from distant stations, picked up by powerful antennas and relayed by microwave. 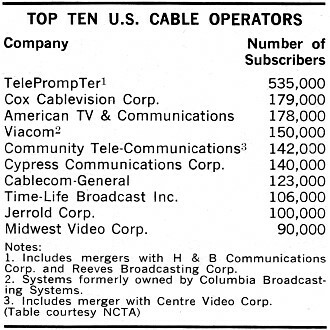 At least one channel can carry programs generated by the cable owner (often including commercial advertising). This is no longer a simple multi-customer antenna service. It is cablecasting. The term "CATV" belongs to a bygone era. By the Numbers. You can gauge the significance of cable TV by the way it has grown. In spite of powerful and determined opposition, its proliferation has been fast and steady over the past six years. More than 2500 cable TV systems presently serve 4.6 million homes in some 4300 communities. Roughly 15 million, or about 7 percent, of the nation's viewers daily watch cable-delivered TV. For this service they pay $4.50-$6.00 monthly - an annual gross revenue for cable owners approaching $300 million. But is cable TV profitable? Look at it this way: Monthly operating costs seldom exceed $2.50 per subscriber. Before-tax operating profits run 50 percent or better. Investment stands at about $600 million. and the return on that investment usually is about 20 percent. 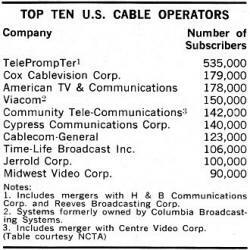 With figures like these, cable TV attracts plenty of capital. The cable TV concept is a mover. One reasonable estimate anticipates that half the country (30 million homes) will be on cable by 1980. At least 7500 systems will he needed to serve the communities involved, and cable owners will invest about $5 billion in facilities. Annual revenues could exceed $3 billion. Commercial broadcast TV grosses about this amount from advertising right now. The whole country will eventually require as many as 15,000 cable systems feeding into 60 million homes and, says one analyst, 20 million businesses. By that time, however, the character of cable TV will have changed again, and a new term will outmode "cablecasting." Cable operators now generate their own live programs on one channel. 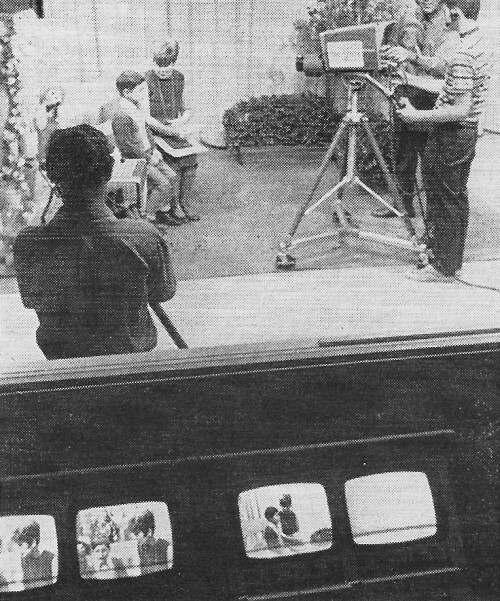 This TeleMation-equipped studio cablecasts black and white. Ups & Downs. Cable TV takes new turns every month. Last summer, cable owners began putting their own programs on one channel. The programs are limited mostly to live community news and sports and to old movies. Few are in color. But the effort is there. Telephone companies own 20 percent of the cable systems. According to the FCC, they cannot operate both telephone service and cable TV. Hence. they have just three years to dispose of their systems. If the FCC has its way, the networks will not be permitted to produce programs for either over-the-air or by wire syndication. This limits the sources of programs for the cable owner. It also precludes networks from eventually feeding cable TV systems. But this particular obstacle may not prevail. New systems are not coming into being as often as they did before. One reason is that cities hesitate to grant franchises. The question of jurisdiction is not resolved. Whether cable franchising should be controlled by the FCC or handled by city or state utility commissions is still up in the air. Weather scanner complete with gauges used by some cablecasters. The scanning mirror reflects readings on gauges and card announcements to camera above. Music is sometimes also transmitted on this same channel. The FCC may decide to issue licenses to cable owners as they do with broadcasting stations, allowing the cities a small franchising fee. The few states that do regulate cable TV take varied approaches. So, for the sake of national uniformity it appears that the FCC will have to do the regulating. A ban already exists against importing signals into the top 100 TV markets. Some people think that importation is unfair to local stations and advertisers. The FCC proposes reducing the ban to only the top 50 markets. Commercials would be deleted and local ads inserted in their places. The idea, however, is technically impractical, necessitating the need for some other solution. The ban has not been ironclad. New York City, for example, is being wired for cable by two companies. The FCC waived the ban, and it may do the same for other large cities. What happens in New York may provide an answer to one key question: Can cable TV be profitable in urban areas where stations are already plentiful. Indications are that it can. About 70.000 subscribers are already signed up in New York, and some 3000 more apply every month. Maps of Utopia. One test of cable TV's value is performance. What can it do for you that is not already being done? Cable proponents make promises - some for now, others for the long haul. A few are likely to be realized, and a few are not. Many rely on unproved technology. Variety of programming sounds like a reasonable solution since modern cable systems can accommodate 20, 30, even 70 channels. But consider what might go on these channels. Suppose that 10 channels are used for nearby commercial and educational TV broadcasts. The cable owner programs one channel with his own originations, provides another channel for time and weather reports, and leaves a third for local school and club news and announcements. This puts only 14 channels to use. Let us say that he imports 10 distant TV station signals. Likely some are network and duplicate programs on local channels. The upshot is that you may not find the variety you were led to expect, but it is more than you would get without cable TV. This video display is coded by a special character generator used by the cablecaster. 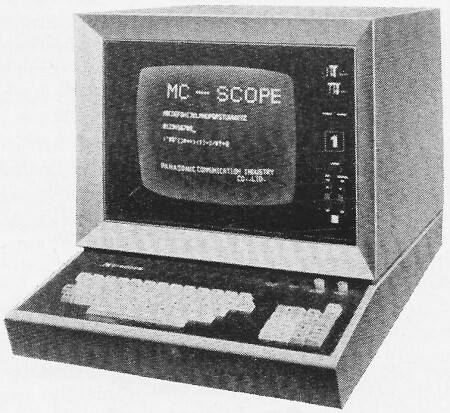 A minicomputer, such as this one, could be hooked into a cable communications system, and could talk with central computer from "office at home." Ideas such as this are costly but within the realm of possibility. A unit that looks and operates like this Panasonic video-display computer terminal could take the place of your present TV. A new Oak 26-channel CATV converter for a conventional TV receiver. Simple controls include channel-selector switch, fine-tuning control, power switch, and pilot light. 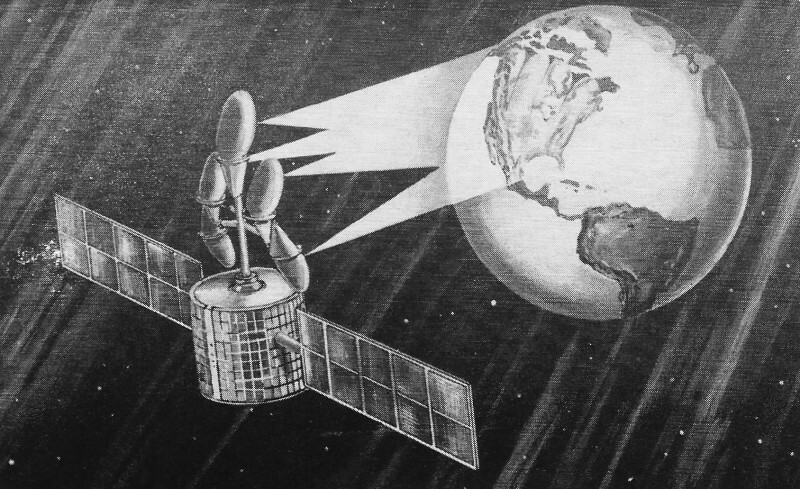 The technology exists now to distribute cable television over a satellite network to stations on the earth (conveniently located for distribution). This plan is from a Sylvania system. Economics will determine whether this particular method will be used. Quality of programming is another promise. Culture, education, entertainment, and community improvement all sound nice in a proposed package. All are technically possible, too. But where to get the financing, producers, directors, talent, and technicians to make the venture a success is the big problem. It is folly to believe that cable TV can provide more reliable programming than has commercial TV, even granting that it will try harder. Nor will it do to attract the talent away from broadcast TV. This will only dry up those imported and local channels. Hometown talent provides a possible out. But mediocrity in today's network attempts draws enough fire. Local productions tend to be even less professional. If you envision an end to commercial advertising, forget it. A cable owner sells advertising for his own channel and often for his weather channel as well. He can commercialize on his channels that provide only music. Local TV and FM channels carry whatever commercials accompany their programs. So far, imported channels do the same; and even if commercials are deleted, local ones will probably be substituted. Working Both Directions. Just around the corner is two-way cable TV. It will open a whole new era. With it, you get into true communication by cable. The term to describe such a system might be cablecom. From thoughts of nationwide two-way cable TV grow some of the "blue-sky" notions you hear about. For example, there is subscriber-to-subscriber hookups. It demands complicated but not impossible switching. 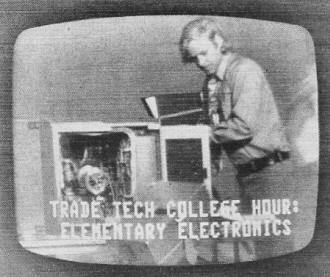 Then there are the "office at home"; the long-awaited home computer terminal; newspapers, magazine articles, books, etc., that can be delivered to your home video/copier on demand. None of these is farfetched. 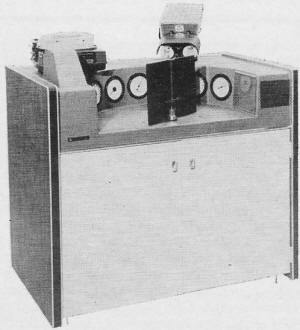 You would perform your own programming by punching the proper buttons to a central library of stored video and audio tapes. You could transmit and receive letters on your home copier, although distant ones might go through a post-office-type exchange. You could even job-hunt and be interviewed by cable TV. These fantasies are not called blue-sky because they are not possible. They are possible. It is simply that they are more expensive than you can now afford. Cable owners agree to add services such as these "as technology permits and subscribers demand" them. This is a polite way of saying that, when the majority of subscribers can afford it, they will get a particular service. Some two-way transmissions would be truly worth their cost. Special cable-com channels allocated to hospitals, doctors, and medical schools would speed and simplify information exchanges, consultations, and studies. Home receivers would not pick up these channels unless at-home care were needed. Law-enforcement agencies would have like facilities. Home and business security alarms could instantly and directly alert police, fire, and protection agencies of anything that might go wrong while you were away. Japan Broadcasting Co. runs a high school at home by one-way TV. Just imagine how much more effective the learning process could be if the system were two-way. Why, even earning a college degree through TV is far from impractical. Outlook with Cable. How will cable TV affect you? For one thing, it will take more out of your pocket. "Free TV" costs your family $50 a year in higher prices for the advertised products you buy. For cable service, you pay about $60 a year. You get more programs, but they are still accompanied by commercials. The result is that cable TV will mean an add-on cost to you; the cost of the products you buy plus your subscriber fee. You will not be affected much by how cable TV operates electronically, but you may be interested just the same. Dial-a-program systems are being tried here (similar to the one in Great Britain). 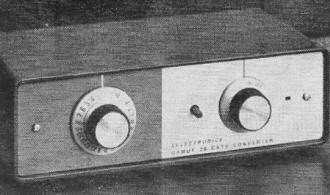 The receiver has no tuner, just a phone-type dial. Numbers of the program channel are dialed in and pulses cause a central exchange to hook the cable to one of perhaps 70 program channels. Interconnected countrywide, these systems might well form the basis for home-to-home cable communications. A satellite or two could distribute cable TV for the whole country. Proposals for the grand plan are already in the works. Intelsat-type satellites carry a dozen or more TV channels. New digital techniques for transmitting color TV signals can double this figure by taking less spectrum space. And two dozen channels should be enough for nationwide network coverage. Microwave is already being used for regional networking. Infrared and laser beams are being studied as another universal possibility for broadband communications like cable. And one company is experimenting with microwave delivery directly to the home. The pictures you view from cable could look better than those of today. Finer definition and smoother, truer color are possible. A cable system can decode the TV signals it receives by present standards and revamp them to much higher standards. Imaginative cable operators may grab at an opportunity like this. The existing cable TV system leaves much to be desired on the technical side. But you would need a new kind of TV receiver for the things that can be done and are not far away. Do not look for any great changes to be made right away. When they come, they will be costly for the subscriber as well as the cable company and so will come in gradually.